What is Mega Blogging Marathon? I decided to opt for option number 1. India has such a huge variety of flatbreads to offer that are made on the stove top, in the tandoor, in the oven, under the grill or fried. 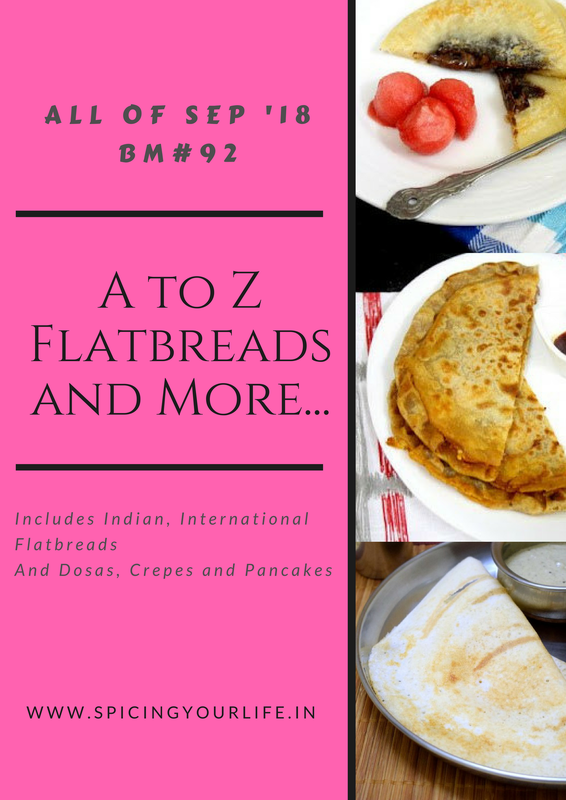 Its going to be a challenge to look for flatbreads beginning with all the letters of the alphabet as for this group cannot use batter based flatbreads. However, am up for this challenge. My first Indian Flatbread is A for Akki Roti. Akki Roti is famous in the state of Karnataka. Its made from rice flour, water, salt with some added spices and a few vegetables. Its usually eaten for breakfast. A piece of the soft dough is patted directly on an oiled griddle. I sure can’t do that as my fingers feel the heat very easily. Instead I used a parchment paper and it was so much easier. No burning fingers or getting burnt! Till now had not tried this roti as I always thought that rice roti would turn out chewy. Amazingly soft and utterly delicious, I don’t mind having this gluten free breakfast everyday. Served with a bit of sambhar, rasam or just chutney and famous South Indian coffee, is all you need to energize you for the day. Here’s the easy peasy recipe and do come back to check what flatbread I’ve made beginning with letter B. Mix flour, salt and cumin seeds. Add chopped coriander, onion, chilli,grated carrot and fresh coconut. Add water and make a soft dough. The dough should be a bit softer than that of roti. Cover the dough with a lid and let it rest for 15-20 minutes. Heat a tava, griddle pan, pan over medium heat. Take a square piece of parchment paper or aluminum foil about 7″ X 7″. Roll the dough into a rough ball. Grease the worktop or board very lightly with oil. Place the parchment paper or aluminum foil. The oil helps it to stick to the board or worktop. Place one part of the dough on the paper and pat it into a round circle using your fingers. Occasionally dip your fingers in water as its easier to pat the dough. Using your finger make a small hole in the middle of the patted dough. Lift the corners of the paper and flip it over on the tawa or pan. Drizzle about 1 tsp oil around the akki roti. Cover the roti with a lid. Cook the roti for 2-3 minutes. Remove the lid and flip the akki roti over. Drizzle about a tsp of oil and roast it for 2-3 minutes. Repeat steps 10-18 with the remaining dough. Serve hot akki roti with some chutney, podi masala, sambhar or rasam. The dough should not be hard. Can add veggies like grated doodhi (bottle gourd), zucchini, chopped spinach etc. Adjust the amount of chilly according to your taste. Don’t cook the akki roti over high heat. Thanks Ritu, do give it a try as its so easy and really delicious, especially when served hot. Super beginning to the Mega Marathon ! We have so much diversity in these rice rotis, truly I am amazed. Akki Roti looks fabulous and I am loving the option of using different veggies . Great pick for the alphabet . Thank you so much Vaishali. The akki roti looks so good and you have presented it so well! I too had this on one of my lists but changed the theme later. Thanks Padmajha, I had other options but am so glad I stuck to akki roti. We love akki roti and I also made it for alphabet A for one of the other Mega marathon. How beautiful your akki roti roti looks with specks of green. Can’t wait to see the rest of your collection. That Akki Roti looks so fabulous. Lovely beginning to the mega marathon….beautiful pictures!!! Thank you so much Sowmya. Wonderful theme Mayuri and am eagerly waiting to see your posts under this Indian flatbread theme. What a kick start yaar, Akki roti looks absolutely prefect and well shaped. You nailed it prefectly. Wonderfully made, Mayuri. We make this also and used to be an afternoon snack in my growing up years. A great start to the mega bm. Looking forward to the next ones. Thanks Harini, Next time will make it as light dinner. As hubby and I are aging, we find that a proper lunch and a light dinner works best for us. This looks so yummy and perfectly done… beautiful colour and the parchment trick is good.. This is one of my fav rotis. With onions and carrots, the roti has turned out absolutely delicious. Can’t wait to see all your Indian breads.. Thank you so much Gayathri. I too loved akki roti, had made it last month. Your’s look so nice and tempting with a lovely green colour on top. excited to watch this space for more flatbreads. Thanks Renu and yes, isn’t it just yummy. I think I mentioned to you that I made it. Akki roti looking awesome, When we were living in bangalore at least every weekend I used to make this. taste great and a perfect meal. We had it with buttermilk. Loved the way it has come out. Great start for the BM. I am also loving it. Thanks Bhawana and I’m glad you are enjoying the BM so far. When I did my first one, I would cook everyday and post. Little did I know that others cooked their dishes way ahead. We learn as we go along. The Akki roti looks delicious. Reading your recipe, it looks quite difficult to make but you seem to have managed it well. Thanks Mina, if you make bajri Dhebra at home then this is a similar technique, then its easy. Your Akki Roti has turned out so good Mayuri, what an excellent choice! The Rice roti is popular in Andhra as well and we often make it at home. I love the lovely colours you got on the roti too! Thank you so much Srivalli. These akki rotis are looking so beautiful with the grated veggies.. a blend of colours and taste.. Thank you so much Shobha. Akki Roti is one of mine fav roti… i tried in banaglore… its look yum and tasty. I love learning about all this different food that I have never tried! Thanks Heidi.. just as we learn about new places from your blog.